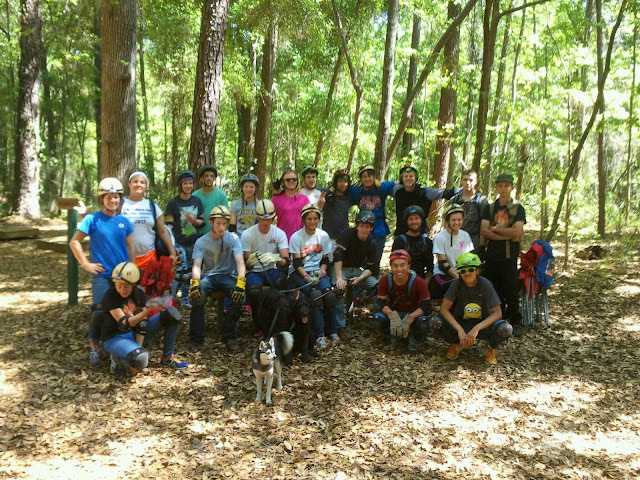 We finished up a great retreat with the high school youth group from First United Methodist Church of Oviedo (FUMCO). We praise God for how well everything went!! Special thanks to an incredible team of volunteers and GTD staff for all the time, effort, and heart you poured into the students and this event. Your help made a bigger impact than you may ever realize! THANK YOU! EDITED MOVIES ORGANIZED!! THANK YOU CAROLYN & JESSICA!! One of our staple activities on GTD base camping events is showing an outdoor movie during one of the nights. We hang up a bed sheet, crank up the generator, plug in the projector and push play. It's a pretty cool experience to sit outside under the stars next to the campfire while roasting marshmallows and watching an exciting flick. We use edited movies so all the garbage (profanity and sexual content) is removed and the actual substance of the movie can be enjoyed. Over the period of many years we have collected about 200 movies. They've needed to be organized for a long time. Now I'm thrilled to say that Carolyn Butler and Jessica Marie have tackled that project and they did a FANTASTIC job! They categorized each movie according to title, year, genre, original rating, run time, and main actors. 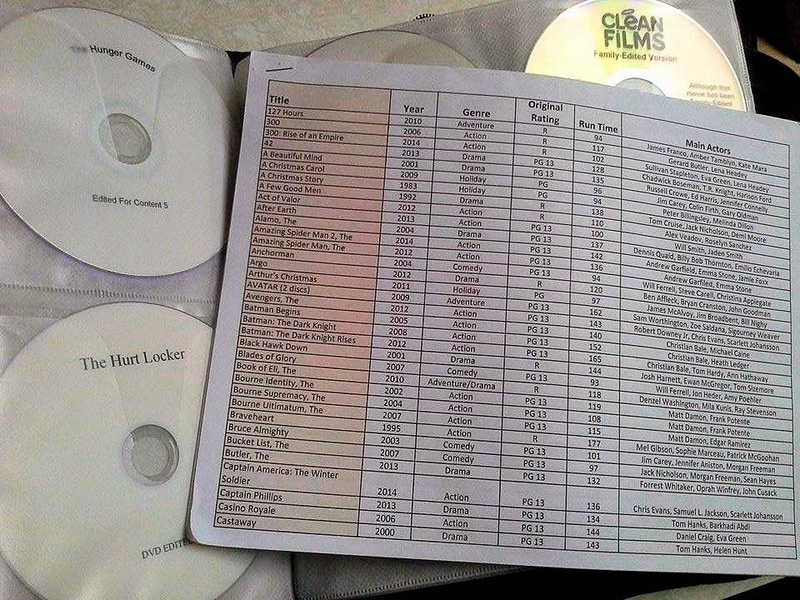 Then they printed up 4 different copies so that the group leaders could search for movies by 4 different categories. It's absolutely a phenomenal job!! 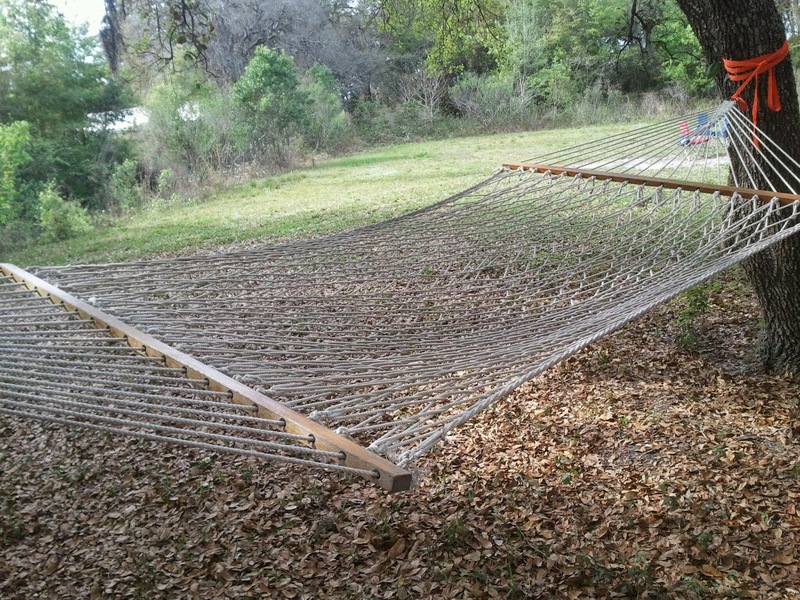 And it's just in time for our next 2 retreats. Thank you Carolyn and Jessica!!! As usual, you blow us away! Great, great job! Oh, it's an exciting time to be a part of GTD! BACK-2-BACK GTD RETREATS STARTING THIS FRIDAY! We are getting ready for 2 God-awesome back-to-back retreats that kick off this weekend. 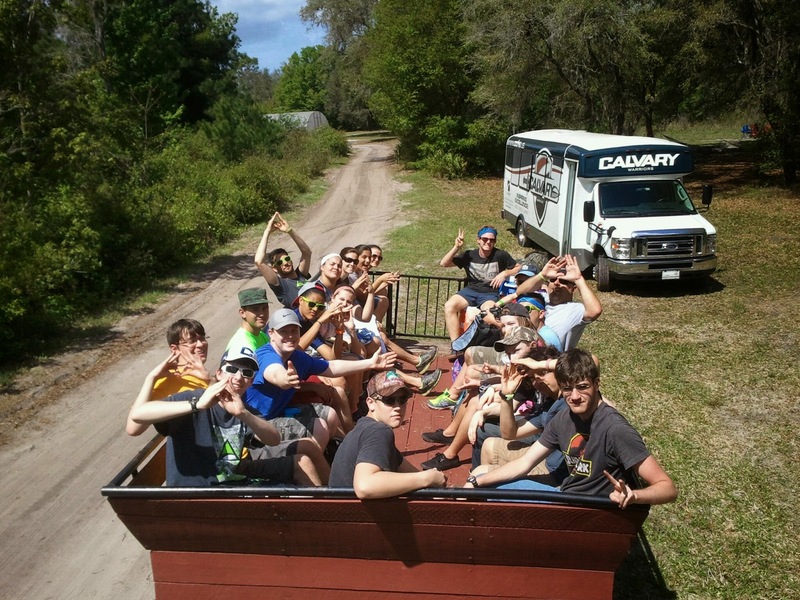 Our first retreat starts Friday night with the high school youth group from First United Methodist Church of Oviedo. 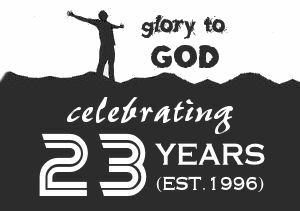 We've been hosting events for this wonderful church for 11 years! Our 2nd retreat begins Monday morning as we kick off our first annual partnership with SOUL Adventures which is based out of Skycrest Baptist Church in Clearwater. This retreat is open to all youths aged 10-15 and will take place at Cedarkirk Camp in Lithia, FL. It lasts till Wednesday. And squeezed in between these 2 retreats Erin will be helping lead up our March SAC (Sunday After Church) event with Smiley's - PAINTBALL!! It's going to be a GREAT 6 days of outrageous Christ-centered fun. Keep us in your prayers and pray for God to use us and these events to impact lives for His glory and kingdom. It's an exciting time to be a part of GTD! RETURN OF THE STAFF MEETINGS! With only 2 people on staff for the past 5 years we fell out of the habit of having regular Staff Meetings. Today marked the return of the Staff Meetings. It went a little long, but it was effective. It was another step in the right direction. We are thrilled to have some more hands on deck. God's doing some cool things. It's an exciting time to be a part of GTD! ORGANIZATION & BALANCE! Laurie has been working on organizing hundreds of GTD tasks. She has been entering them into our Google Drive account so that our staff & volunteers can have access to them (and hopefully adopt some of them!) from anywhere in the world. About 85-90% of the work of the ministry falls on my shoulders and this is one of the ways we are trying to share the load. Nearly 20 years of 12, 14, 16, and 18 hour work days 6-7 days per week is more than enough. Actually it's way too much. It isn't sustainable and that's why we are striving so hard this year to get to a healthy place in running this organization. Many hands make for light work and God has been blessing GTD with some great faithful volunteers, partners, and staffers in ministry. We still have 9 months until we turn 20 years old and we are pushing hard to have everything in order to go into the next 20 years in GREAT shape. Speaking of great shape and balance, I'm working at getting back to a strong level of fitness. My nutrition has been pretty poor for the past 5 or 6 months. I'm happy to say I started back working out 2 weeks ago. 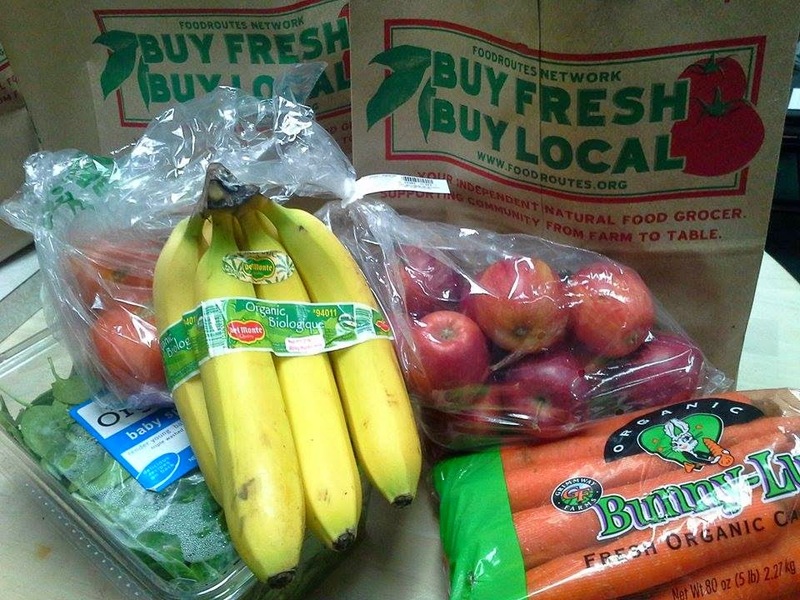 Tonight Laurie and I went grocery shopping. She already eats healthy regularly. I'm getting back on that wagon. Soon I hope to also add a few more hours on to my 4 hours of sleep each night. We only have 1 body to use for our entire lives and I had better get back to taking care of this one if I want to be of any use for the next 20 years of ministry. We are striving after some significant changes. Hopefully you will notice many great improvements as we journey on through 2015. It's an exciting time to be a part of GTD! RECON FOR DUG! 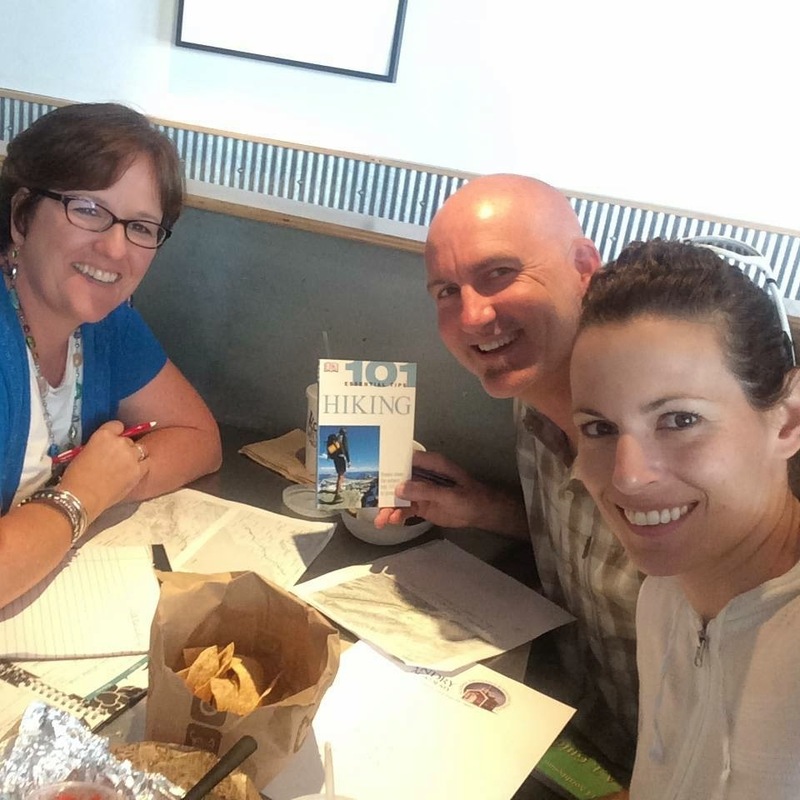 COSTA RICA PLANNING FOR LAURIE! I spent the day "reconing" (aka: doing reconnaissance of) campgrounds and mt bike trails with my good friend Paul Williamson - Director of Soul Adventures. Soul and GTD are teaming-up for our first ever retreat partnership. The retreat is called The Spring Break-Out Retreat and is geared towards youth 10-15 years old. It takes place during Spring Break March 30 - April 1. Reconing is invaluable. 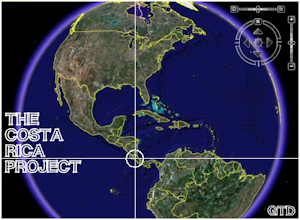 It's the first step at figuring out how to logistically accomplish our mission. It allows us to work through the learning curve, make mistakes, and implement immediate solutions so that the entire group doesn't have to experience the setbacks of doing something for the first time. 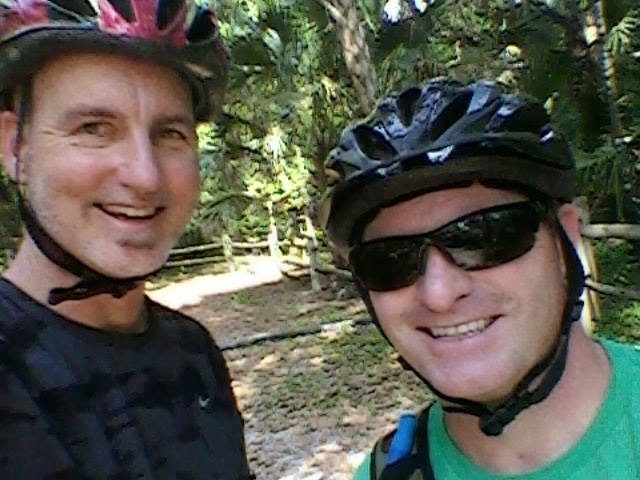 A lot of times reconing can actually be uneventful and somewhat boring, but today was a blast as we zipped down some exciting mt bike trails at Alafia River State Park. While I was away from the office "playing" Laurie was at the office working diligently on our upcoming summer mission trips to Costa Rica. She loves to work on mission trips and pieced together the preliminary agendas for 2 private events planned for June and July. 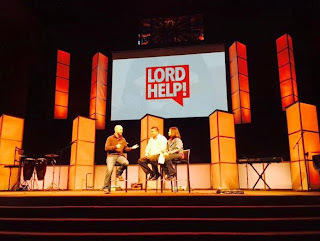 There is a lot of good stuff going on in GTD and we are thrilled about what God is doing and where He is directing. It's an exciting time to be a part of GTD! DAY OF REST for me. DAY OF STRIVING for Laurie. Part of rebuilding the walls of GTD is getting to a place of healthy balance between striving and resting. We are getting there and the ministry will only flourish more when we attain this balance. 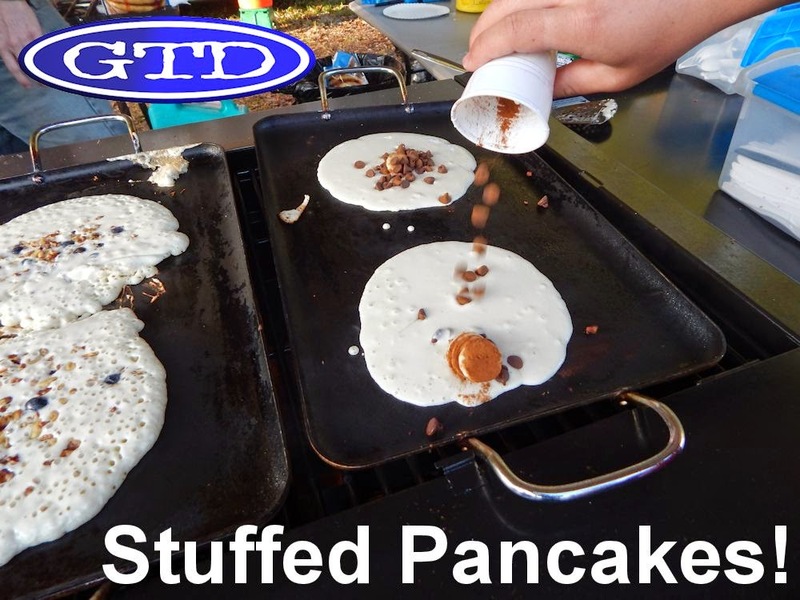 One of our new additions to the GTD menu is mega sized stuffed pancakes. Choose from bananas, blueberries, walnuts, pecans, cinnamon, and chocolate chips. Fill your cup. Then STUFF your pancake! It's been a big hit. Delicious! EXHAUSTED! Working through a day full of personal exhaustion. So glad to have a growing team of staff & volunteers that are shouldering more & more of the load. One of the measurements we use to gauge the success of a GTD event is whether or not our participants want to come back again. 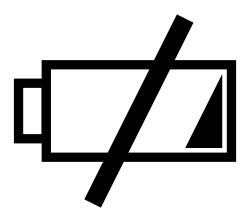 Based on that one indicator I would have to say this past weekend was an overwhelming success. God blessed us with such a great time. The students, the volunteer leaders, and Pastor Justin and Carie made it easy to succeed. They were so much fun and dove into every part of the retreat with positive Godly attitudes. 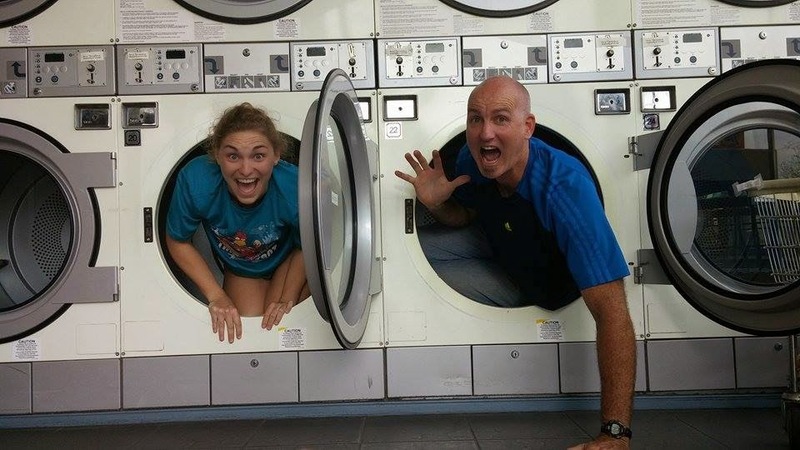 Justin and Carie made the most of every opportunity to speak into their student's lives and convert our daily adventures into teachable moments for Biblical life principles. The students soaked it in! Our prayer is that God uses each of our events as part of a transformation process as we strive to become more Christlike. Our time around the campfire each night became a time to share highlights of the day, sing praise & worship, and dive into a challenge from Pastor Justin... as well as a time to make some smores. In the mornings we took time to seek God through prayer and reading from the Bible. Then we would come back around the fire ring and share what God was teaching us. It's always an amazing time to listen to young people share what God is teaching them... which also ends up teaching us as well. One of my highlights from the weekend came when we were 30 feet underground in a cave and we all turned off our headlamps so we could experience total darkness. The students wanted to sing a praise song with the lights off. It was such a powerful moment. This morning also served as another highlight as we watched 22 young participants work hard to breakdown & pack-up camp before leaving. They did a FANTASTIC job. We gathered up for one final farewell and hugs goodbye. As the group drove away one of our GTD volunteers commented that this had been a great group of students that displayed positive attitudes, strong work ethic, and a real hunger for God. All I could say was that the students are a reflection of their leadership. 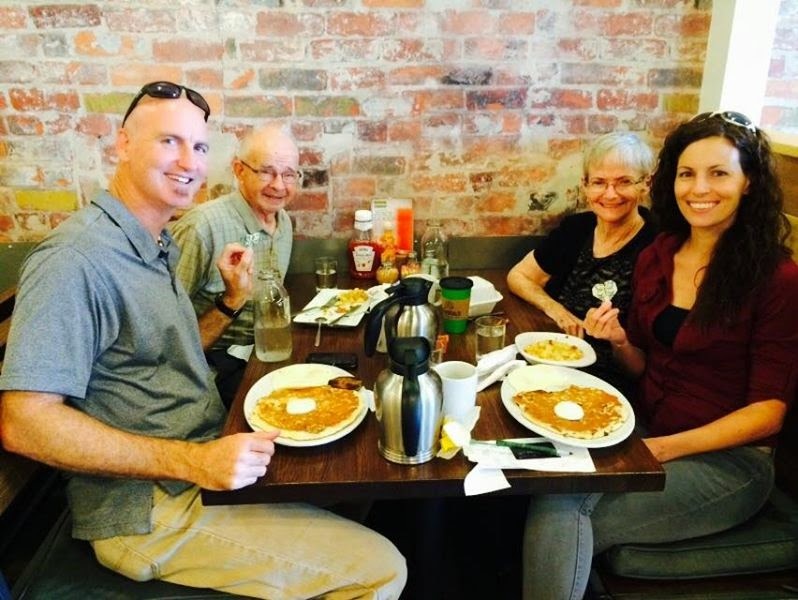 We are excited to see what God is doing in the lives of the youth at Calvary Baptist Church of Clearwater and we were blessed to work with Justin, Carie, Dickie, and Denise. We look forward to watching what God continues to do in and through Elevate High School Youth Group! 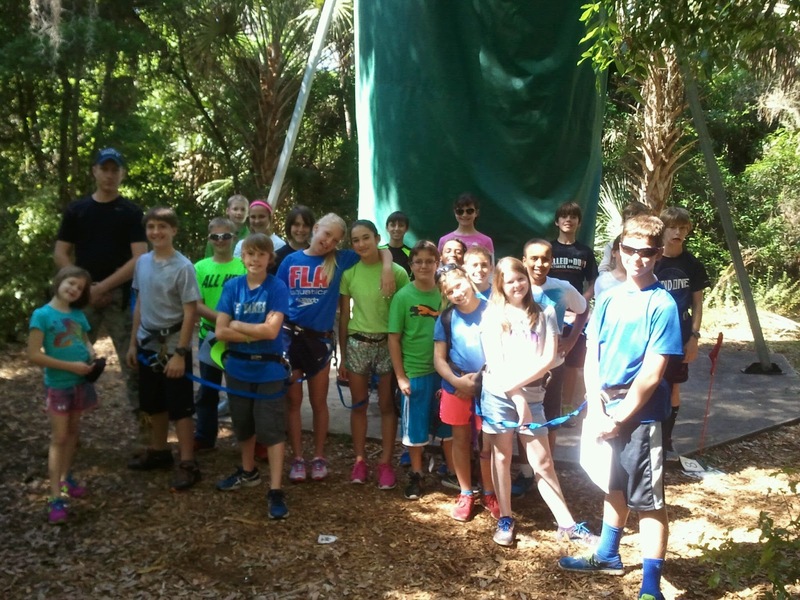 We had a FANTASTIC day today with the high school youth group from Calvary Baptist Church of Clearwater! It's hard not to have a good day when it's filled up with stuffed pancakes, daily devotions from John 15, wagon rides to the bathroom, caving 30 feet underground, total darkness, singing worship songs in total darkness, teachable moments, non-stop fellowship in a shuttle bus, make your own pizzadillas, praise & worship around the campfire, a day full of challenging message from Pastor Justin, smores, and late night showers. It's been an amazing day of great memories. Thank you Jesus for what you are doing in the lives of young people!! 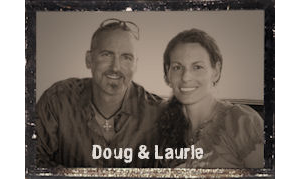 CBCC RETREAT MARCH 14-16!! We are excited about our camping retreat with the high school youth group from Calvary Baptist Church of Clearwater. We spent today setting up camp. We have a great weekend planned including a day of caving, an adventure race, outdoor movie, campfires, smores, and some great time seeking God. It's going to be a God-awesome weekend! Follow our posts to see all the fun. 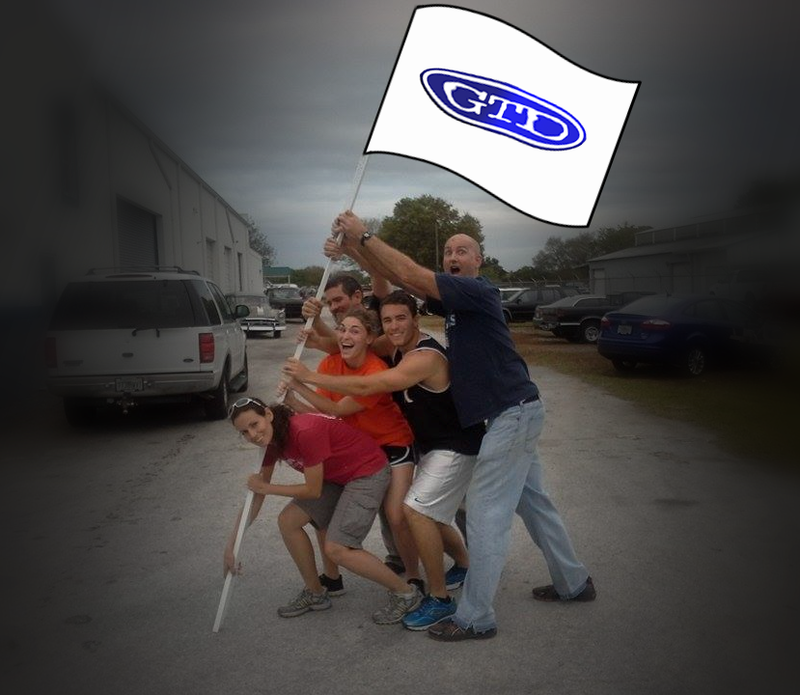 Maybe your group will want to experience a GTD event! It's an exciting time to be a part of GTD! MAKE A DIFFERENCE! VOLUNTEERING FOR GTD JUST GOT SIMPLER! GTD is growing and we need more volunteers!!! 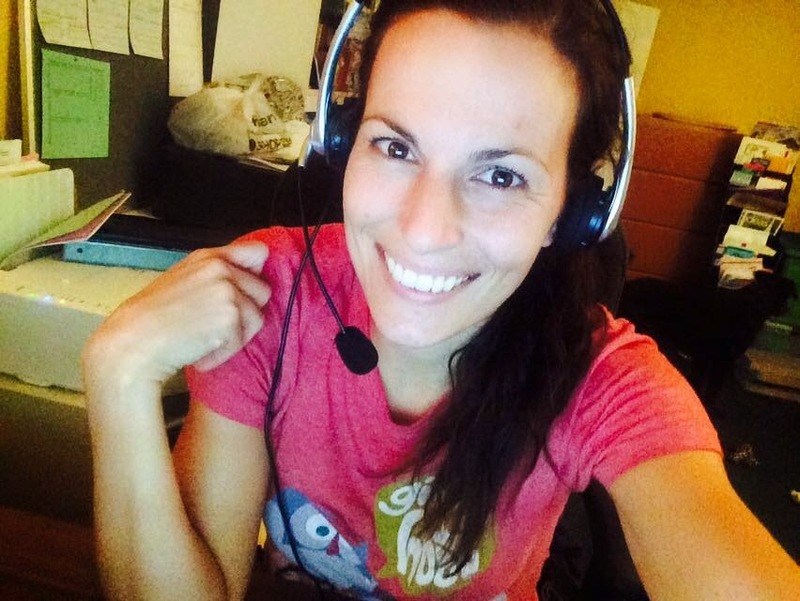 Special thanks to "Scrubs" (aka Erin) for creating our new online Volunteer Application Form. Click on the link, complete the form, and start making a difference in a ministry that God's using to impact lives. It's an exciting time to be a part of GTD! 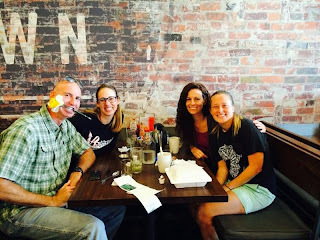 PARTNERSHIP, PLANNING MEETING, AND BACKPACKING WITH LANDRY ACADEMY! We are honored, excited, and thrilled to be partnered with Landry Academy for 2 big backpacking trips this year. We loved meeting with Jen Henriksen today as we continued planning out 2 big backpacking trips for this summer. Jen is an administrator for Landry Academy and has the position of Director of Travel and Community Network. 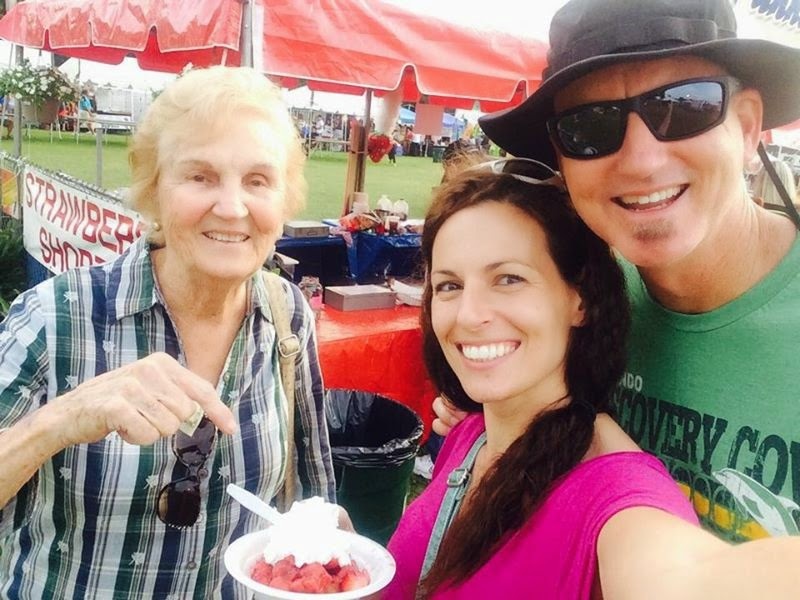 We love Jen and what she's doing to advance the gospel through adventure and international travel... not to mention her adventurous spirit and zeal for life! 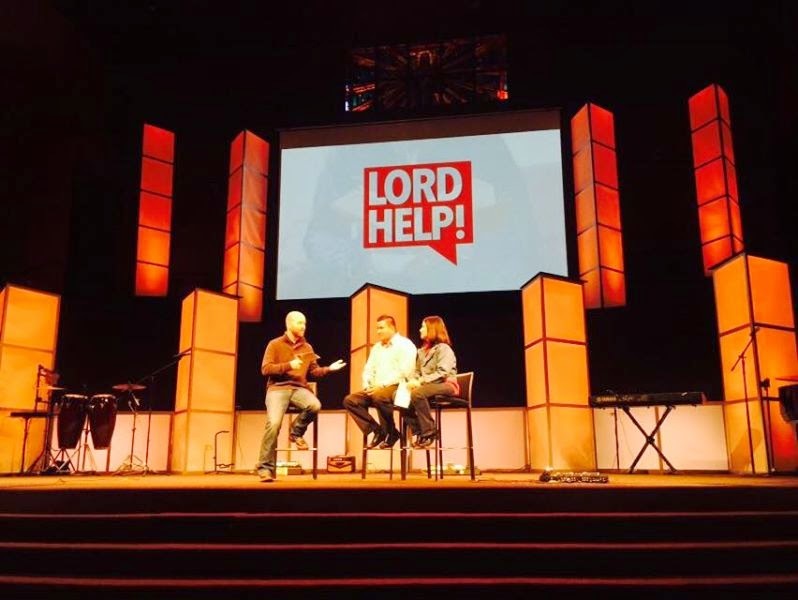 We look forward to all that God is going to do through this partnership! These partnerships another way God is rebuilding the walls of GTD! Good things ahead. It's an exciting time to be a part of GTD! 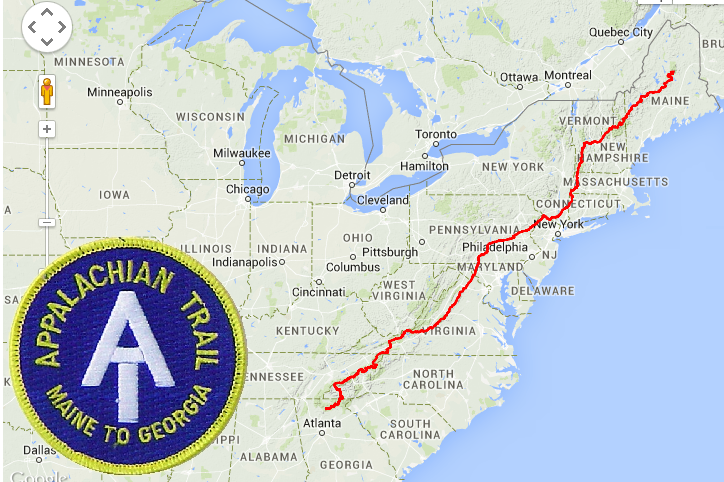 WATCH OUT APPALACHIAN TRAIL (AT), HERE COMES GTD! We are planning out 2 section hikes on the AT for this year and talking about the real possibility of doing the entire 2180 miles of trail (thru hike) next year! It's an exciting time to be a part of GTD! SUMMER IS ALMOST FILLED UP! One of our goals during our 52 Days campaign is improving our approach at filling up our annual event calendar. Well, God beat us to the punch! Before we even had a chance to implement enhanced efforts God moved the hearts of several pastors & group leaders to register for GTD events. We've had a very busy spring and our summer calendar is almost filled up. In fact, one of the good "problems" of why we didn't get even more done during the actual 52 days (and we did get A LOT done) is that we had so many groups signing up for GTD events this year. A lot of work goes into building God-awesome trips so a lot of time has gone into writing contracts, reserving activities & venues, planning out daily agendas, and creating Trip Organizers for each group. In fact, I'm working on 2 more contracts right now. Praise the Lord! It's panning out to be an amazing year! It's an exciting time to be a part of GTD! DAY OF REST! I was planning on doing some GTD work today after church, but I resisted. It's hard to cease from striving when you love your work, are seeing great progress, and see more that needs to be done. But sometimes the greatest act of faith is doing nothing. WORK DAY PROGRESS... RECLAIMING THE 2nd FLOOR TERRITORY FOR GTD! We loved our work day with our small army of awesome volunteers. Special thanks to Richard Dunn, Erin Powell, Alex Powell, and Laurie Finger for their hard work and fun-loving attitudes as we stormed the GTD office and attacked the projects that will unleash this ministry to make greater impacts for causes of Christ. LOVE these people, LOVE this ministry, LOVE where we're headed! It's an exciting time to be a part of GTD! NEW GRAND CANYON ACCOMMODATIONS IN SPECTACULAR PAGE, AZ!! We are constantly working hard to add new elements to our annual Grand Canyon Trip and one of this year's new additions will be our SPECTACULAR accommodations. 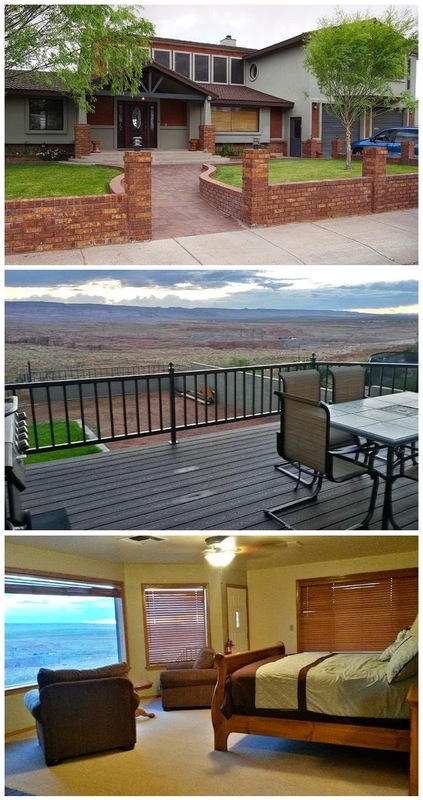 This spacious 5200 square foot home in Page, AZ is perfectly situated on the Rim of Manson Mesa overlooking spectacular views of Lake Powell, Glen Canyon Dam, Vermillion Cliffs and Canyon Lake Golf Course. Boasting three levels and four master suites this home has enough square footage to comfortably accommodate a small army of adventurers. It's only minutes away from Antelope Slot Canyons, Lake Powell, and the amazing Horseshoe Bend! Literally steps off the back yard and through our own gate is access to the Rim Trail, a hiking/walking/running/biking trail that circles the town of Page. The large backyard has plenty of space for activities and includes: a grass lawn, a cement pad with basketball hoop system, a covered patio with lounge furniture, and a BBQ for outdoor grilling. This will be one of our best locations ever! This year's Grand Canyon Trip is scheduled for Oct 5-10, 2015. The website link with event details is in the works and will go live soon. Make plans today to join us on this once-in-a-lifetime God-awesome trip. OVER HALF WAY THERE! HELP US KEEP MOVING THE THERMOMETER UP!!! To add to the great lyrics of Bon Jovi's 1986 hit, "Woah, we're (OVER) half way there, Woah, livin' on a prayer." We truly are living on a prayer and thanking God for His provisions as we trek closer to our $250,000 funding goal. We have seen the needle go up (& down) over the past 6 weeks since we last posted an update. Thankfully it settled on a 10% increase as of the end of February. That brings our current total projections to 55% of our total goal! Praise God!! We will try to update the thermometer at the end of each month. Reminder: THIS IS A VOLATILE THERMOMETER which means it can go up or down based on projections over the remainder of this year. Things that can make it go up are new Ministry Partners, fundraisers, unexpected donations, adding more private trips to the calendar, exceeding anticipated amounts of participants on events, renting out gear, and product line sells. Things that can make the thermometer go down are cancelled events and lack of follow-through of monthly pledges. As stated before, we are humbled and thrilled by God's mighty hand of support, and we are elated by the generosity of our donors. 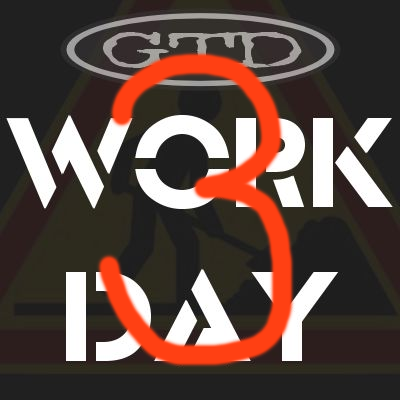 This has already been an amazing 3½ months of rebuilding the walls of GTD. We are excited, but we are not relaxing. We are pressing on towards the goal that will put GTD in position to effectively minister to the next generation for the next 20 years. Nov 18, 2015 - Jan 18, 2016: Reintroduce "The New GTD"!! 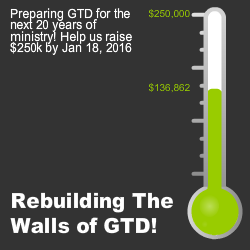 This is an exciting time to be a part of GTD! WORK DAY #3 THIS SATURDAY!! The work continues on. 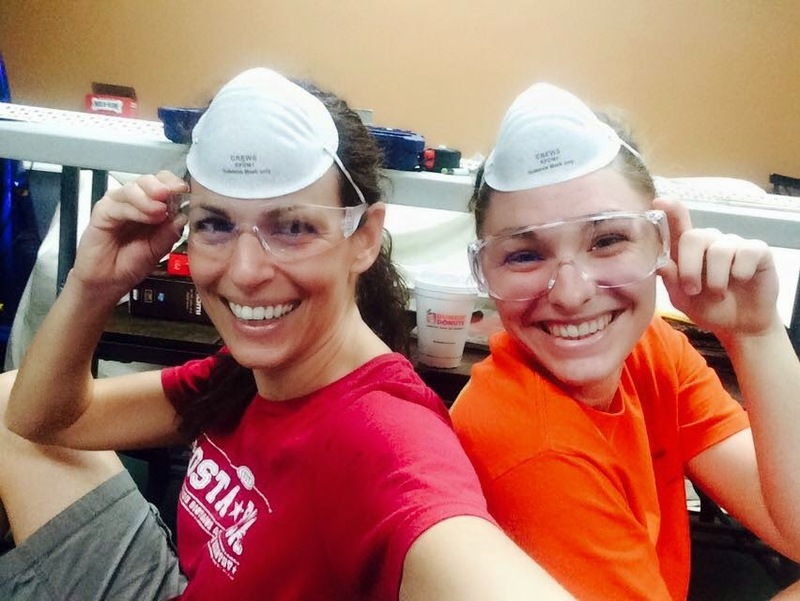 This Saturday we are tackling more GTD office renovations. Things are shaping up! Click on the link below to sign-up for a few hours or for the full day of volunteer work. Free lunch included! It's an exciting time to be a part of GTD! PASTOR DANILO SPEAKS AT HARVEST CHURCH! Pastor Danilo share his vision for church growth and outreach for the church in Costa Rica with the Harvest Church congregation. Good things are on the way... more info to come!